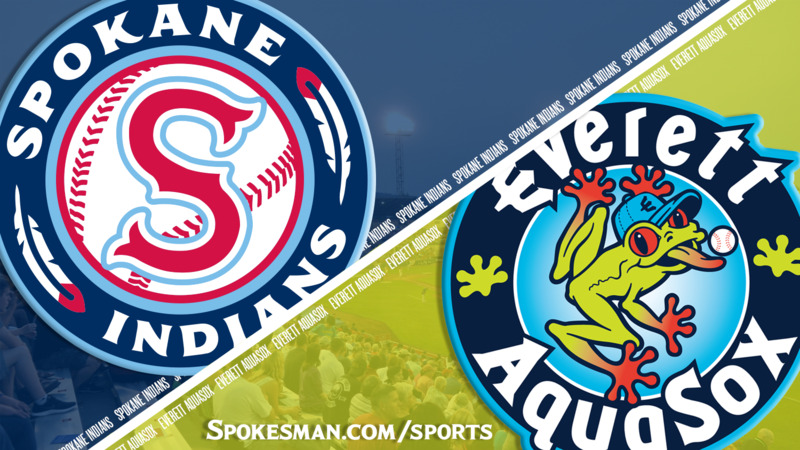 EVERETT – The Spokane Indians are still looking for their first road win of the Northwest League season and Josh Stowers is a big reason why. Stowers staked the Everett AquaSox to an early lead with a second-inning home run and he added a two-out, two-run double in the bottom of the sixth inning to help down the Indians 7-4 at Everett Memorial Stadium on Monday. The loss drops Spokane to 0-12 away from home. The Indians (12-19) have two more games at Everett (17-14) and then a five-game series at Salem-Keizer to close out the first half of the season. Everett took control early against Spokane starter Werner Leal and chased the right-hander from the game with a three-run second inning. Leal (1-2) surrendered four hits and three walks while recording just five outs. Francisco Ventura put the Indians on the scoreboard in the top of the fourth with an RBI single to cut the deficit to 3-1. Charlie McConnell’s solo homer off Indians reliever Scott Engler pushed the lead back to three but Spokane slugger Curtis Terry answered with a solo shot, his league-leading ninth, to pull Spokane within two. Spokane added two runs in the eighth on Ventura’s second homer of the season and a bases-loaded walk to Jax Biggers. Published: July 16, 2018, 10:50 p.m. Updated: July 17, 2018, 3:14 p.m.